Pillows of creamy homemade ricotta have been lightly scented with fresh herbs, with a small hidden surprise, is nestled between layers of fresh homemade semolina pasta and then gently cooked before being sprinkled with fresh black truffles. I imagine everyone has been touched at least once in their lives by cancer. I knew people who were dealing with it when I was growing up, but it really did not hit me until a few years ago, when my friend Dawn, was diagnosed with cervical cancer. I was devastated. This was not supposed to happen to someone so young, let alone someone you love! Then a few years back, almost at the same time I started this site, I met Barbara of Winos and Foodies and through her, I met Jen of Use Real Butter, two more amazing women who were battling cancer. Each of their stories touched me in so many different ways, I wept with each word, I smiled at how strong they were and I shared with Lenny, daily, how amazing I thought each of them was. During this time I was dealing with something that we were not sure what it was and cancer was definitely an option during the 6-month testing process. Always in the back of my mind, I told myself, that Dawn, Barbara, and Jen were survivors and that if they had the courage, I could battle anything and that this was only going to be a bump in the road. I was lucky as the outcome was not cancer but rather premature menopause; but it was these three amazing women that helped build the strength in me, during a time when I needed it. I thank you each for being who you are and how extraordinary you make every day! Since this time we have had a few more friends who have been diagnosed with different forms of cancer and each time we are left speechless and saddened. But, each person fights it and ends up being a stronger person for the courage and strength they used during this battle, we admire you for this and want you to know we are there for each of you! In honor of the LiveSTRONG event, Barbara sent us an email asking us to participate, of course, we said yes. I am always honored when she asks us to be part of her events. I knew that I was going to make one of our favorite dishes homemade Ravioli with egg; but, I did not know until Sunday morning that I would include homemade ricotta. I sent out a tweet asking if anyone had a recipe for ricotta and Holly of Holly Hadsell-El Hajji was the first to respond with her recipe. 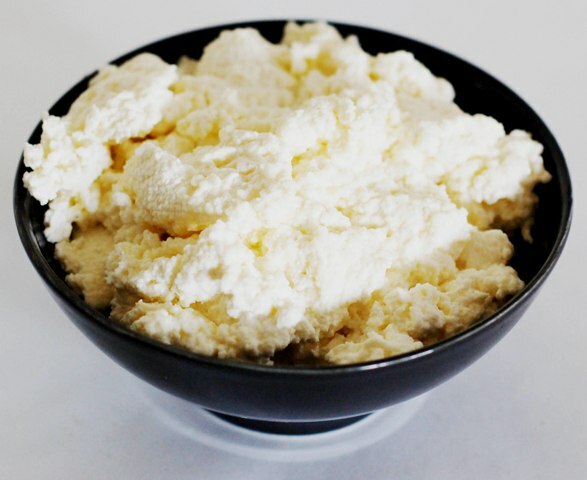 It is so easy, so easy in fact, I will never buy ricotta again. It was the icing on the cake for this ravioli recipe. I seasoned the ricotta with fresh thyme and oregano as well it had a slight floral taste to the cheese, due to the fresh Meyer lemon juice I used to make it. We made our own semolina pasta, using the newest addition to our KitchenAid family, the pasta roller. It made life so much simpler and we were able to make a thinner pasta, which was perfect for this ravioli. Inside each little pillow of ricotta, we put a raw egg yolk and then we gently cooked them just until the pasta was al dente and the yolk still runny. Topped off with a drizzle of olive oil and fresh black truffle! An amazing meal for an amazing cause – Thank You, Barbara! 14 Responses to "LiveSTRONG With A Taste Of Yellow 2009: Ravioli filled with homemade ricotta and runny egg"
Oh...my...god...I wish I was the one slicing into that ravioli! It reminded me of Martha's segment about Richard Gere's restaurant thathas the ravioli with their farm fresh eggs. Yummy! Denise and Lenny Thank you for your kind words and your support of A Taste of Yellow. I shall add home made ricotta to my recipe files. I love the photos - such a fabulous yellow. What a touching post Denise. Reading it made my heart heavy yet makes me happy to see the strength & spirit of the beautiful people you mention. This is a beautiful taste of yellow...very very charming. Beautiful photograph! I'm always touched by stories of women who are surviving cancer, although some of it didn't make it. Dad died of cancer two years ago and this event that we're joining is a great way to bring people together to become more aware of this disease. That ravioli is really lovely. Simple yet elegant and delicious. Thanks. Thanks for sharing this, what a great tribute to both those you know/admire, and to your own perseverance. This ravioli with homemade ricotta sounds incredible! 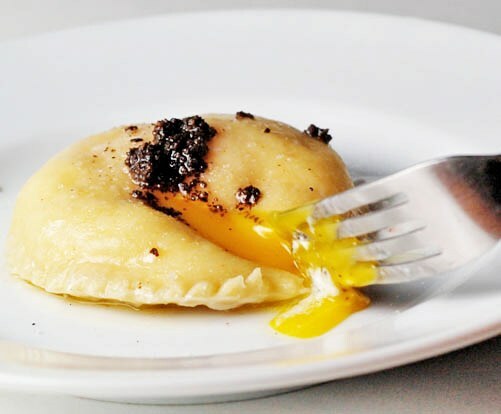 And, every time I see ravioli with an egg yolk, I think how I want to try making some. Still have attempted it. Beautiful food to go with a beautiful post. I love that yellow is tge color that goes with this event. How appropriate! It reminds us to have hope and that there is sunshine despite all the heartache and sorrow. WOW. That ravioli looks/sounds amazing. So simple, yet so beautiful! Cancer has touched my life in many direct ways so I truly appreciate your support. I found your blog on Tasty Kitchen and I love it! I also have been making your banana bread recipe for weeks, and wrote about it on my blog! It is incredible! !